I have a massive fragrance wishlist as I’m a massive perfume addict, and love nothing more than adding new scents to my fragrance collection. 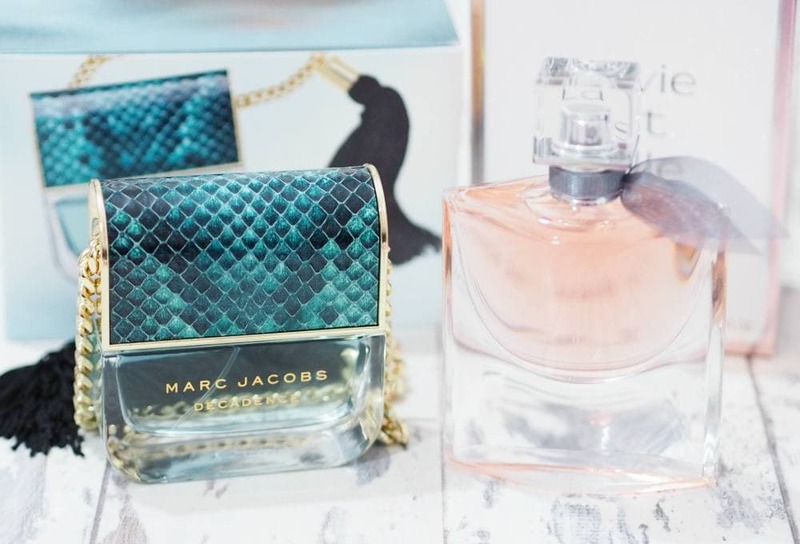 Recently I added two new additions to my collection which have both been on my fragrance wishlist for quite a long time; the Marc Jacobs Divine Decadence and Lancome La Vie Est Belle fragrances, and I’m thrilled to finally own them. Obviously with fragrance, the most important thing is their but both Marc Jacobs Divine Decadence and Lancome La Vie Est Belle have incredible bottles and they’ve taken pride of place in the front of my fragrance display. 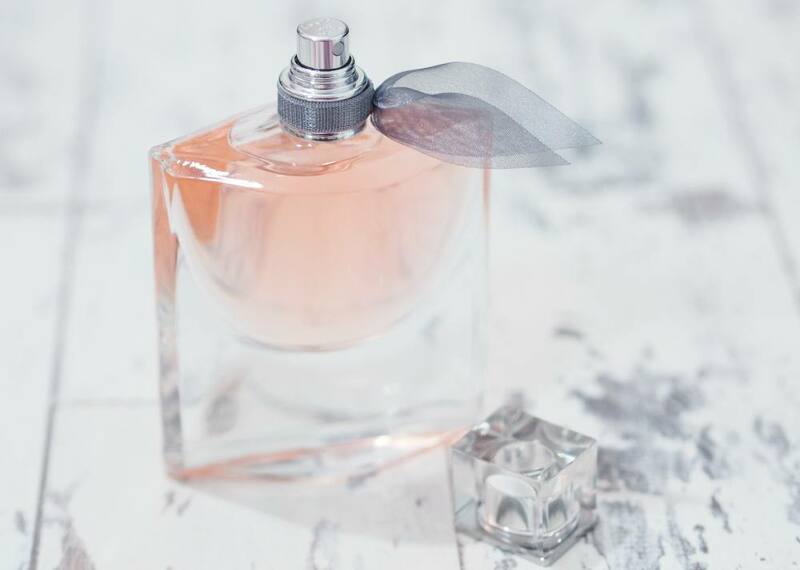 When looking for new fragrances, I like to make a beeline for The Perfume Shop, especially as they now offer an engraving service on selected scents which is such a lovely personal touch particularly when purchasing gifts. In addition to the engraving service, they also offer very affordable and quick delivery which is ideal as I hate waiting for online shopping orders. Top notes: Champagne, Orange Blossom, Bergamo. Heart notes: Gardenia, Hydrangea Accord, Honeysuckle, Iris. 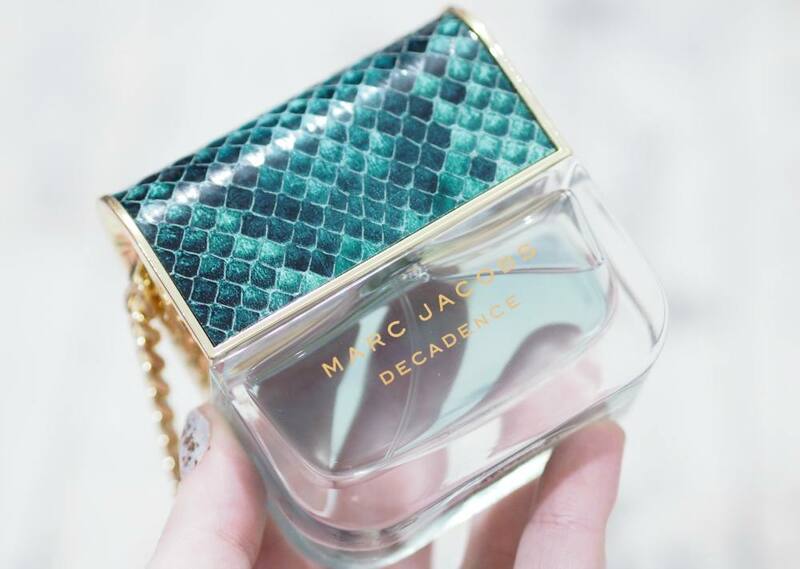 The Marc Jacobs Divine Decadence bottle is definitely the most ornate I’ve seen from a fragrance brand with a trademark Marc Jacobs tassel which is pretty huge in comparison to the bottle. 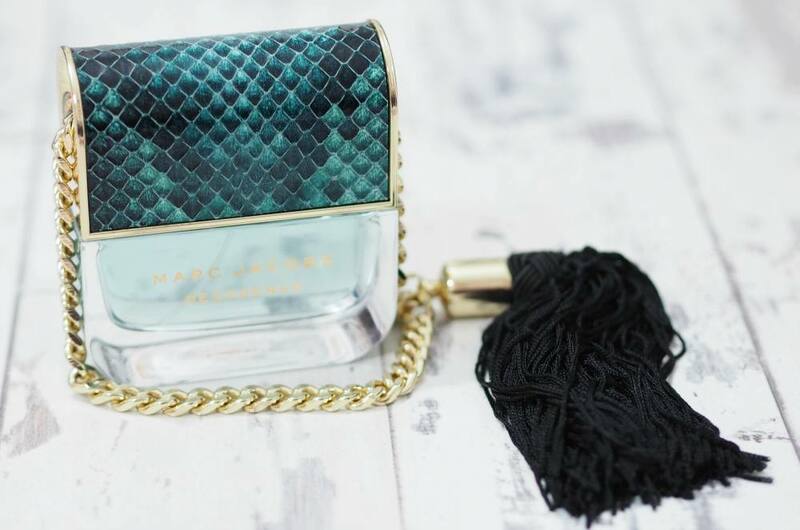 The bottle is designed to look like an handbag, just like the original except the newer Marc Jacobs Divine Decadence has a paler coloured fragrance liquid and the lid features a lighter green faux snake print whereas Decadence has a black faux snakeskin print on the lid. In the box, the lid is wrapped separately to the bottle with a very weighty gold chain which loops through the lid. I’m not entirely sure I like the garish and over the top lid as it’s so weighty and a faff everytime you want to spray the bottle but it’s part of the fragrance’s design and the 30ml size bottle doesn’t have the tassel so if the tassel does put you off, the 30ml size might be the better option. Usually I find fragrance reviews quite easy to write however Divine Decadence is the hardest scent to describe and I don’t think I’ll be able to do it justice but I’ll try my best. Upon first spritz, Divine Decadence is a strong white floral, with a citrus twist which smells very ‘green’ and fresh. I find that the gardenia, hydrangea and honeysuckle are the most prominent notes and I think it might be somewhat of a marmite scent for many depending on whether or not you like white floral scents or not. I think Divine Decadence is also very spicy, almost in an herby way which is down to the saffron and it reminds me of one of my trips to India where we visited a spice plantation so it triggers happy memories of that trip – it always amazes me how fragrance can catapult you back in time to a place/event in just one spritz. I smelt La Vie Est Belle for the first time when I received a compliments slip from Lancome alongside a product, which they’d spritzed with La Vie Est Belle and I loved it so much that I had to email and ask them which scent it was as I loved it so much so I’m beyond happy to have my hands on it. 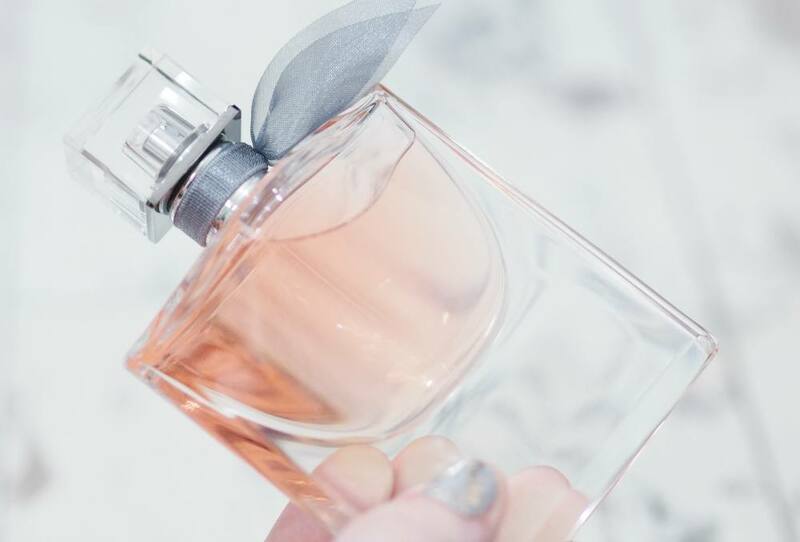 Lancome La Vie Est Belle launched in 2012 and the fragrance is centred on the idea of natural and simple beauty, freedom from conventions and the choice of once own vision of happiness. The fragrance is a kind of outlook on life, inspired by joy and pleasure in small things.